ANKOM Technology is a laboratory equipment supplier. They develop and manufacture analytical products for use in the laboratory analysis of food products. 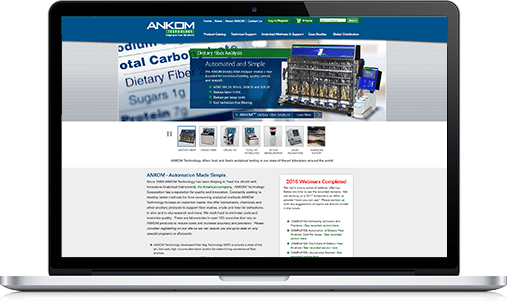 ANKOM Technology had previously seen limited results with their current SEO service. They had identified 222 highly important search terms, and had only managed to rank for 4 of those. As their traffic was mostly referral traffic (almost no organic traffic) and very random, they were looking to find a solution that would create consistent traffic and rank for relevant search terms. SEO theming issues. There were no rankings in the top 100 for all but four of their high priority terms. Regular penalty checks to see how the site would respond to our fixes. We also sent instructions to prevent future issues stemming from duplicate and thin content. Regular technical audits with feedback from Google’s tools as well as in-house tools. Deep keyword research. We expanded the initial 222-keyword list to over 1000, to build relevant authority, create proper theming and target terms that had good monthly search volume.